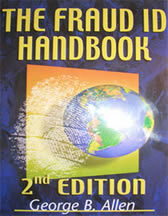 More than any other subject, fraud is the number one reason investigators are hired to investigate a case. Everyone has exposure to fraud. Almost all of us have lost money due to fraud. Fraud costs society many hundreds of billions of dollars per year, taxing the US economy as much as ten percent of its efficiency. This book will be of extreme value to private investigators, insurance claims adjusters, law enforcement, lawyers and security professionals. Introduction-Confidence Games That Target Businesses And Organizations-Confidence games That Target Individuals. Copyright: 2005 All rights reserved.